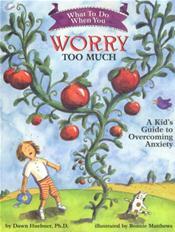 What to Do When You Worry Too Much is an interactive self-help book designed to guide 6.12 year olds and their parents through the cognitive-behavioral techniques most often used in the treatment of generalized anxiety. Metaphors and humorous illustrations make difficult concepts easy to understand, while prompts to draw and write help children to master new skills related to reducing anxiety. Engaging, encouraging, and easy to follow, this book educates, motivates, and empowers children to work towards change. Includes a note to parents by psychologist and author Dawn Huebner, PhD. Ages 4-8.